Several countries in the EU have adopted gender quotas that regulate the composition of electoral lists in an attempt to address the underrepresentation of women in political institutions. This column examines the effect of the introduction of gender quotas in local elections in Spain. While the quotas have increased the number of women elected, they have not significantly increased the probability of women reaching leadership positions, or the type of policies that are implemented. At the same time, fears that quotas would decrease the quality of politicians have not been realised. In spite of the progress that has been made in the last decades in terms of female labour force participation and educational attainment, women are still largely underrepresented in political institutions. Among EU countries, women account for only 27% of MPs and 12% of prime ministers. To address the scarcity of women in politics, ten EU countries have adopted gender quotas in recent years that regulate the composition of electoral lists. Furthermore, in 13 other EU countries, gender quotas have been adopted voluntarily by some of the main political parties. Source: Global Database of Quotas for Women, International IDEA, Inter-Parliamentary Union and Stockholm University. Available at www.quotaproject.org. Electoral quotas are highly controversial. Supporters argue that politics is not a level playing field and, by increasing the share of female candidates in the ballot, quotas can improve the overall presence of women in political institutions, breaking down negative stereotypes among voters and party leaders, contributing to the emergence of role-models and female networks, and promoting awareness regarding women’s underrepresentation in politics. Quotas may eventually generate a trickle-up effect, leading to a larger presence of women in leadership positions and fostering policies that are more aligned with the preferences of female voters. On the other hand, objectors point out that by restricting the composition of the pool of candidates, quotas violate the principle of merit and may lead to a decrease in the quality of politicians. The available empirical evidence suggests that when quotas are well designed and parties cannot easily game them, they help to increase the number of women elected (e.g. Baltrunaite et al. 2016, Dahlerup and Freidenvall 2013, Esteve-Volart and Bagues 2012, Matland 2006). However, relatively little is known about the capability of quotas to increase the presence of women in leadership positions or to promote policies that are more female-friendly, or about their impact on the quality of politicians. The most influential evidence comes from Sweden, where the voluntary introduction of candidate gender quotas by the Social Democrat party led to an increase in the presence of women in leadership positions (O’Brien and Rickne 2016) and in the qualifications of politicians (Besley et al. 2017). In a recent paper, we provide a comprehensive analysis of the impact of candidate gender quotas using the unique quasi-experimental evidence offered by their introduction in Spanish local elections (Bagues and Campa 2017). In the context of closed lists with proportional representation, the quota prescribes that at least 40% of the candidates in the list should be female (and male). The provision applies to the entire list, and also to every block of five candidates. The quota was first implemented in 2007 in municipalities with more than 5,000 inhabitants, and was extended in 2011 to municipalities with more than 3,000 inhabitants. We take advantage of the existence of these population cut-offs to implement a regression discontinuity design where we compare municipalities slightly above and below these cut-offs over three rounds of elections (2007, 2011, and 2015). By comparing municipalities that are practically identical in terms of population (the optimal bandwidth is around 1,000 inhabitants), this empirical strategy is robust to the existence of any other relevant factors that vary smoothly at the threshold. The analysis provides information on the impact of quotas in an important context: relatively small municipalities, likely in rural areas, where the persistence of gender stereotypes tends to be stronger and where women have been traditionally excluded from decision-making to a larger extent. 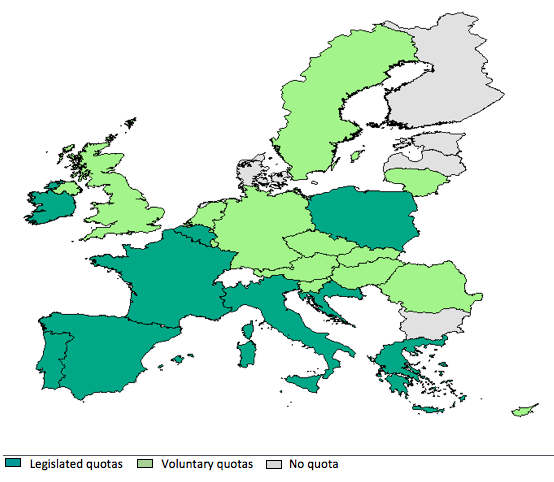 Interestingly, this is a group of municipalities that many countries have decided to exclude from the quota (e.g. France, Italy, and Spain). We analyse the impact of quotas in five dimensions: (i) the composition of candidate lists, (ii) the number of women elected, (iii) the quality of council members, (iv) the presence of women in leadership positions, and (v) the type of policies implemented by municipalities. As expected, the quota increased the share of women in electoral lists in Spain (by 8-10 percentage points to reach 46%), which, due to invisibilities, is de facto the mandated threshold in treated municipalities. The quota also increased the share of female councillors, but the effect is smaller (3-8 percentage points) due to the strategic positioning of women in electoral lists. These positive effects appear in the first election in which the quota was applied. We do not observe any additional growth in women’s representation in the two successive elections. To analyse the impact of the quota on the quality of politicians, we use two sources of information. First, we analyse the educational attainment of municipal council members. We do not observe any significant differences between municipalities that were affected by the quota and those exempted. Second, in the spirit of Casas-Arce and Saiz (2015), we compare the number of votes received by party lists that were forced by the quota to increase the share of female candidates and party lists that already satisfied the quota requirements before its introduction. According to these results, voters did not perceive the new candidates as being less qualified than the men they replaced. Overall, our findings suggest that gender quotas do not decrease the quality of politicians, but they do not improve it either. Furthermore, quotas did not increase the probability that women reach leadership positions, either as party leader or as mayor. The share of female mayors was equal to 13% in 2003 before the introduction of quotas. By 2015, it had increased to 19%, but we do not observe any significant differences in the evolution of those municipalities that adopted the quota and those that did not. Finally, we study the impact of quotas on policies. We do not observe any significant changes either in the size of the municipal budget nor in its composition. In order to identify which areas of public expenditure are closer to women’s (and men’s) preferences, we use survey information where 57,000 voters report which issues they consider most important. Gender differences tend to be generally small, but men report being relatively more concerned about infrastructure, agriculture, and the environment, while women are more worried about the health system, education, social services, pensions, and unemployment. Quotas do not increase the weight that these fields receive in the local budget. In sum, our study confirms that quotas in electoral lists increase the number of women elected. However, during the ten years in which quotas have been in place in Spain, they have not significantly affected the probability that women reach leadership positions or the type of policies that are implemented, at least in small municipalities that were the object of our study. At the same time, the fear that quotas would decrease the quality of politicians has not been confirmed: quota candidates have similar educational attainment and they attract a similar number of votes compared to the candidates they replace. The lack of women in top political positions is an important problem which, in the absence of some type of public intervention, is likely to persist for many years. However, our findings suggest that electoral quotas may not be a one-size-fits-all solution. More research is needed to get a better understanding of the underlying causes for the underrepresentation of women in politics and the policies that might be most effective to correct it. Bagues, M and P Campa (2017), “Can Gender Quotas in Candidate Lists Empower Women? Evidence from a Regression Discontinuity Design”, CEPR Discussion Paper No. 12149. Baltrunaite, A, A Casarico, P Profeta, and G Savio (2016), “Let the voters choose women”, CESifo Working Paper Series 5693. Besley, T J, O Folke, T Persson, and J Rickne (2017), “Gender quotas and the crisis of the mediocre man: Theory and evidence from Sweden”, American Economic Review 107(8): 2204-42. Casas-Arce, P and A Saiz (2015), “Women and power: Unwilling, ineffective, or held back?”, Journal of Political Economy 123(3): 641-669. Dahlerup, D and L Freidenvall (2013), “Electoral Gender Quotas and their Implementation in Europe”, Study for the European Parliament. Esteve-Volart, B and M Bagues (2012), “Are women pawns in the political game? Evidence from elections to the Spanish Senate”, Journal of Public Economics 96 (3): 387-399. O'Brien, D Z and J Rickne (2016), “Gender quotas and women's political leadership”, American Political Science Review 110: 112-126.